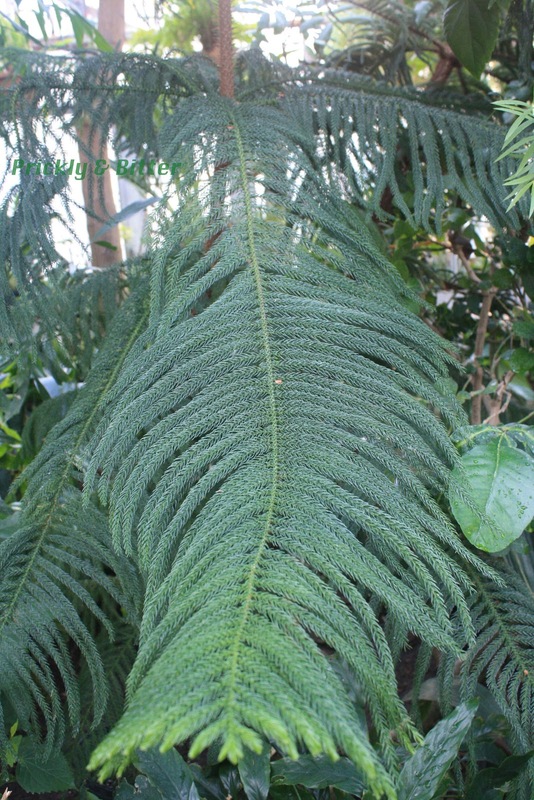 The Norfolk Island pine, as the common name suggests, is native to the very small island of Norfolk Island, located between Australia and New Zealand. Contrary to what the common name suggests, it is not a pine. Due to the incredibly small native range and the wild hunting of this species, it is listed internationally as vulnerable. 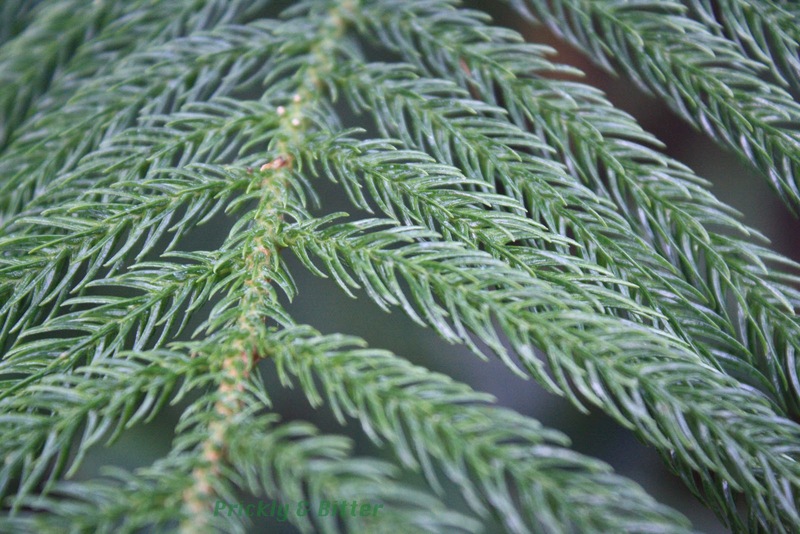 The Norfolk Island pine is an incredibly popular ornamental species due to its almost perfect triangular symmetry. 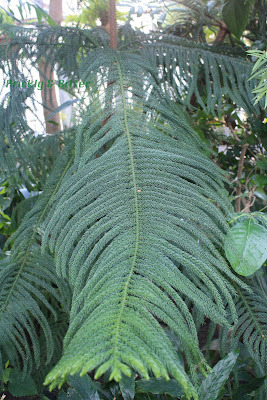 When young and grown in optimal growth conditions (which this greenhouse doesn't have; you can tell by the shape of the tree), the branches are closely bunched and project almost straight out from the main trunk. The branches are subdivided, and these branchlets project outwards towards the tips of the main branch, but fanning outwards at about a 60-degree angle (see the second picture to get a visual of what I'm trying, poorly, to describe). The amazing geometry of this species makes it, by far, one of my favourite tree species. I have never tried to grow it indoors, but I'm guessing that I would be disappointed at the results. The Norfolk Island pine REALLY doesn't like being confined to a pot! 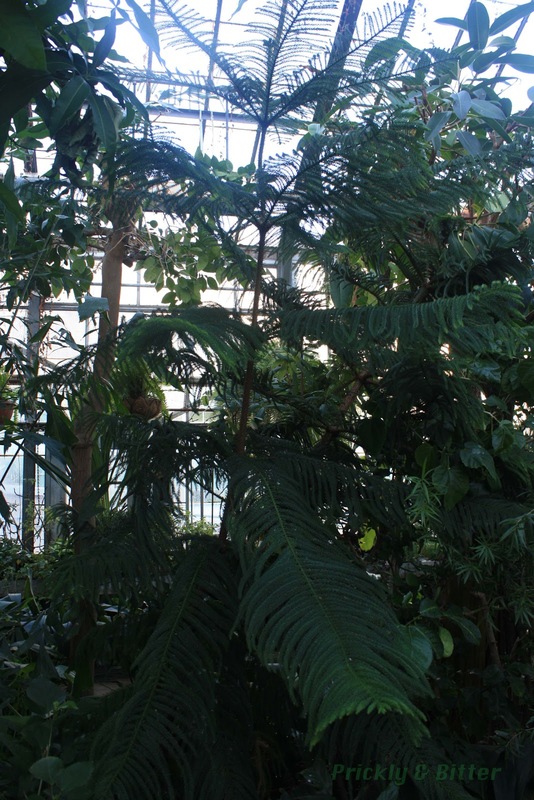 It is widely planted outdoors in subtropical and tropical locations: Florida, California, Hawaii, some regions in Brazil and Chile, resort and tourist areas in Honduras, and in lush areas of South Africa. Fortunately, there is a huge market for commercially-grown greenhouse Norfolk Island pines, so they are rarely disturbed in the wild (and they are now a federally-protected species). 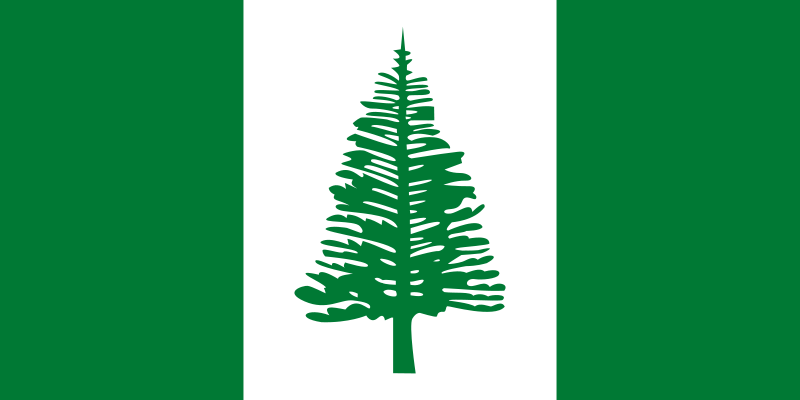 In fact, the Norfolk Island pine is so valued by the island that it is the main symbol on their flag! 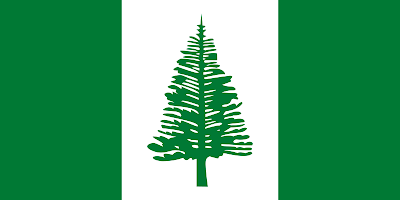 And what a lovely flag it is; picture a green Canadian flag but with a Norfolk Island pine tree instead of a maple leaf. 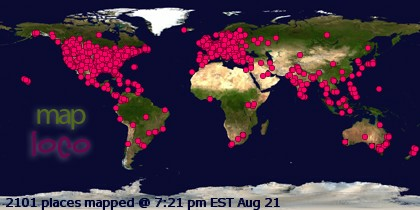 They do say that copying is the most sincere form of flattery...right? Surprisingly enough, this tree has actually been banned as an ornamental species in some coastal communities in Florida and California, and this has nothing to do with the potential for being invasive (which it isn't). Due to frost damage, the main trunk and bottom branches of these trees can become very fragile, and only attached by the innermost woody tissues. As soon as the first big wind storm (or hurricane) hits, the trunk and/or the lower branches go flying off, even when other tree species in the area remain standing. This can cause serious property damage, and can even result in the loss of lives due to flying debris. As a result, the tree has been banned and other native trees have been suggested in its place. 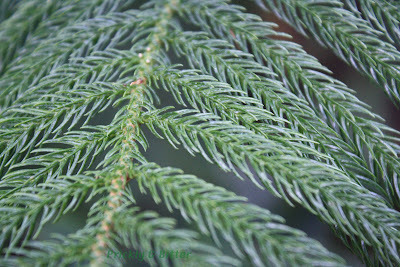 The cones of the Norfolk Island pine, which I have unfortunately never seen (they look spectacular in pictures! ), are enormous and look like they should be big enough to snap off the tips of the branches due to their weight. Once the cones are mature (after about 18 months! ), they split open and completely disintegrate, releasing the nut-like edible seeds on the inside. If you have one of these trees as an ornamental species and get cones from it, roast some of the seeds and let me know what they taste like! Remember, don't ever collect seeds in the wild; because this is an IUCN Red List species in the "vulnerable" category, it is against international laws to collect seeds from wild individuals. I wouldn't want anyone to get arrested!